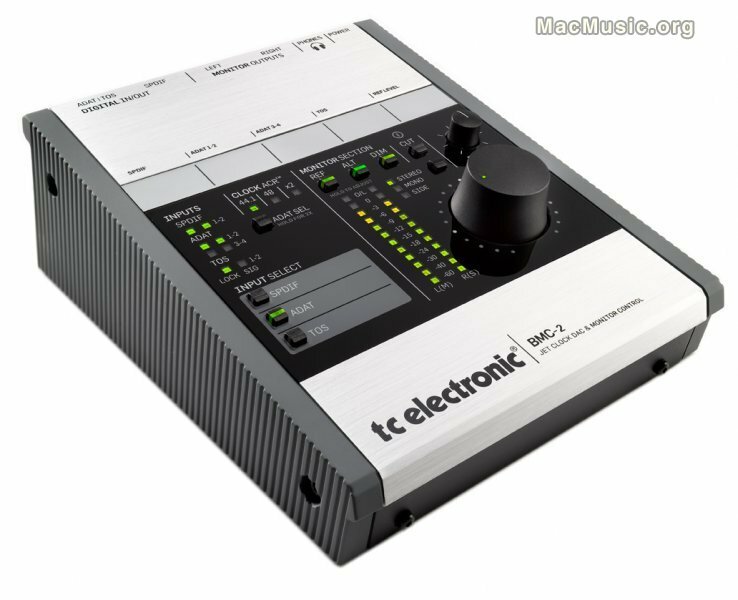 TC Electronic will be launching BMC-2 at the 2009 Frankfurt Musikmesse, a dedicated Digital-to-Analog Converter and high quality Monitor Control that is suited for use with digital and analog speakers. BMC-2 drives one set of analog speakers, one set of digital speakers and a set of headphones. Calibrated listening is available with both sets of speakers and the headphone output. But it's not all about DAC and Level Control – BMC-2 also puts user-definable reference levels at your fingertips. Simply hit the REF button and BMC-2 will attenuate the output to a user-defined sound pressure level. BMC-2 precision re-clocks all inputs, and features high performance jitter rejection based on TC's patented JET technology that was originally developed for TC Electronic's System 6000. Analog output offers wide dynamic range on XLR connectors. Peak level metering and Integrity Check – or 'iCheck' – is also available on the selected input. iCheck reveals if the signal is spatially compromised, e.g. because of data reduction, such as MP3 or AAC encoded at too low a bit rate.